Chad Schiel, was born and raised in Colorado where he has been fly fishing since age 6. At age 18 he enlisted in the United States Marine Corps and served five honorable years as an intelligence analyst. During his time in service he introduced many of his fellow Marines to the art and sport of fly fishing. Chad currently lives in Foothill Ranch, California with his wife Jackie. He is the owner of Emerge Fly Fishing Specialties and spends a great deal of his time instructing new anglers, developing warm water tactics, and innovating new fly patterns. He has created an entire line of brilliantly developed and creative flies for Rainy’s Flies and Supplies out of Logan Utah, and his fly patterns can be found in fly shops throughout the country and abroad. To date, Chad has caught thirty four different species of fish on a flyrod, his travels have given him the opportunity to fish in both salt and freshwater environments. 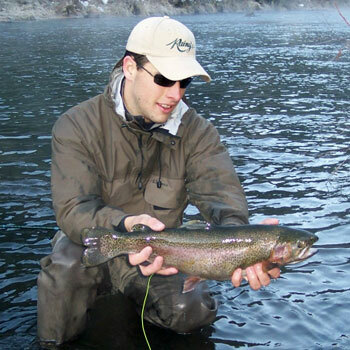 He is a self-taught fly tier and angler, who enjoys sharing his passion and experience with others. To learn more about Chad's articles, videos and fly patterns and proucts visit his website, www.EmergeFishing.com/.